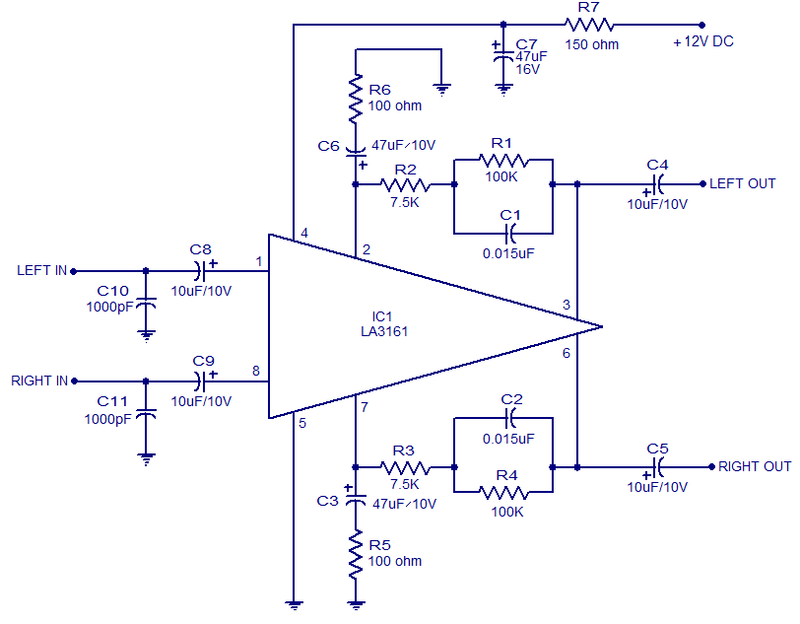 LA3161 is an integrated 2 channel pre-amplifier intended for car stereo applications. The LA3161 has a built in voltage regulator which plays a great role in improving ripple rejection . The IC requires minimum number of external parts and the noise level is very low. The IC has high input impedance (around 100K) and is available in an 8 pin SIL package. In the circuit both of the built in amplifier section are used. Capacitors C8 and C9 are input coupling capacitors. Capacitors C3 & C6 are noise filter capacitors. The lower cut-off frequency depends on the value of C3 and C6 network comprising of components R1, R2 & C1 defines the frequency characteristics of left channel and the network consisting of R3, R4 &C2 defines the frequency characteristics of the right channel. C4 and C5 are output coupling capacitors. C7 is the power supply filter capacitor and it must be connected as close as possible to the power input pin (pin 4) of the IC. This IC doesnâ€™t have short circuit protection, and short between pins may cause damage. C10 and C11 are meant for preventing radio interference, interference from engines etc. Maximum allowable power dissipation is 200mW. Is this circuit (A preamp circuit, generally) required before a power amplifier circuit? I am considering building a PA with an instrument input. I’m considering using your published 2x 12 Watt Hi-Fi power amplifier schematic to drive the speakers. (http://www.circuitstoday.com/2×12-w-hifi-amplifier-circuit) How well are the channels isolated in this IC? Hi This is a head preamplifier (voltage amplifier with play back NAB frequency correction)to feed to an Aux input of any amplifier. How many watts for this amp ? How watts this amp ?